Landing in Dar es Salaam at 3:00 a.m. was a somewhat unnerving beginning to our eight-day African adventure. Unlike many airports around the world, leaving of the baggage claim area places you right onto the street in front of the airport. As soon as we stepped outside we were greeted by the hot, damp African mosquito infested heat. After stopping for a moment to get our bearings, the onslaught of white-shirted taxi drivers began, "Jambo! Taxi! Where do want to go?" 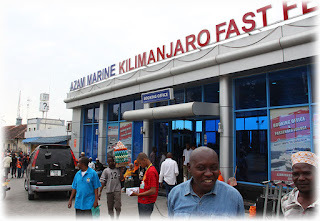 Knowing that the ferry to Zanzibar did not leave Dar until 7:00 a.m., I brushed off the overzealous greeters and headed for the information desk. The sleepy-eyed young African man sitting in the booth slowly slid open the window and with a wearied gaze said "yes?" I asked how far it was to the ferry and he replied, “Twenty minutes by taxi or forty minutes by bus, but please do not go to the ferry now because the station is not open for three more hours and it is not safe to wait on the streets." 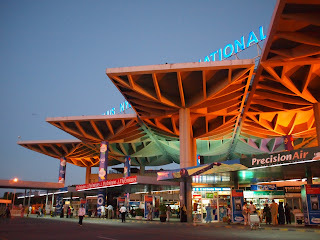 So there we were, sitting on a bench in front of the airport, sweating and swatting mosquitoes. After traveling for eleven hours, an additional three hours in these conditions seemed unbearable. Just as all hope evaporated from our bodies, we noticed a light turn on in the fast food diner across the street. We reluctantly walked over and pulled on the door. To our surprise, it opened and the rush of cool air hit me in the face. Granted it was probably still 80 degrees inside the diner, but we gladly took refuge in an open booth. There were still a handful of mosquitoes inside but we happily enjoyed our chicken sandwiches, fries and warm cola. There was a small group of us there inside that little diner waiting for the Ferry. A German couple, two young blond girls from Denmark and a trio of European backpackers who talked loudly about their recent travels. As dawn approached we all began to gather our luggage and prepare to leave. Not having a ferry ticket yet, we felt we should get there as soon as the doors opened. The German couple asked the girls from Denmark if they wanted to share a cab and were first out the door. As soon as we exited the diner, a short, middle-aged African man in a bleached white button-down shirt shouted, "Jambo! Taxi?" Fortunately I had done my homework at the information booth and asked about taxi fares. 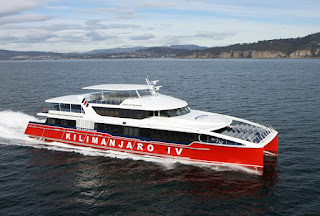 A ride from the airport to the ferry for non-residents was $35 U.S. It wasn't until later that I learned of the "skin tax," a surcharge added to taxis, ferry tickets and really just about anything to non-resident visitors. Traffic wasn't bad and the sun was just beginning to shine some light on my first glance of Africa south of the equator. We drove for about 20 minutes before stopping in front of a string of small tin roof shacks. We looked at each other with wide eyes of puzzlement. The following conversation ensued:"Where's the ferry?" "You must get ticket here." "No, where is the ferry?" "Just over there, not far, get ticket here." "JAMBO! JAMBO!" 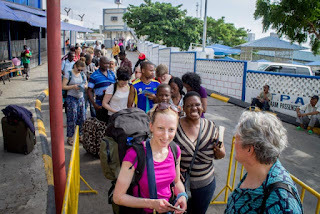 The sidewalk was instantly full with young African men grabbing at our luggage and walking toward a 10' x 10' room with four chairs and a desk. "WAIT! STOP!" I yelled. "It's okay, my friend. Jambo. Please come inside," a man assured me. "No, we will wait here. We have friends that are coming." How quickly I had associated the small group of refugees from the chicken hut as 'our friends.' My hope was once they all arrived we would discuss our plan forward together. Strength in numbers. So we stood there in the pre-dawn moments surrounded by people insisting we go inside and that it wasn't safe to stand along the roadside. They explained that we needed to buy our ticket now and that the ferries were overbooked because of the New Year's holiday. As our cab driver drove away I began to question what the hell just happened. Reluctantly, we went inside. We were quickly informed that there we no more seats available in economy class. If we wanted to be on the 7:00 a.m. ferry, we needed to pay $50 U.S. each. Kim had researched the ferry ticket prices before we had left home: VIP tickets were $35/person. Frustrated and running out of time, I agreed. "Okay, here is $100, give us the tickets." The 20-something year old behind the desk quickly wrote me a receipt and asked for our passports. He called out to a boy on the street and gave him our money and passports. We both shouted in unison, "NO! He is not leaving with our passports." “He must get your tickets now! No time! Ferry is leaving soon." "No," I said. "I will go with him." "Okay, no problem. Please just fill out this form," and with me distracted, the boy with our money and passports slipped out the door. Furious, I became indignant. "What is going on here? What kind of operation is this? Where are our friends?" The young man was very cool. "Please be calm. Your tickets will be here soon." You are from America, yes? Obama country," he said with a big smile. As Kim sat guarding our luggage, I stepped outside and with arms crossed, glared down the street waiting for a glimpse of the young boy who had our money and passports. The sun was now breaking over the horizon and for the first time I was getting a look at the area where the seemingly kind taxi driver had brought us. There was a string of similar 10' x 10' shacks about two city blocks long. The street was packed with African people of all ages now. I knew that I dramatically stood out as an angry white man pacing in front of this row of what I had come to believe as con men. Suddenly, in the corner of one of these shacks two doors down from ours I saw the frightened faces of the two Danish girls. "Are you two okay?" I asked. "We don't know? We have been here for 30 minutes. They have taken our money and our passports." I reassured them that we were in a similar situation not far away and that we wouldn't leave without them. Before I could ask the whereabouts of the German couple, the husband stormed out of yet another shack and headed into "our" tin shack. Out of curiosity, I quickly followed. "They won't take my money. Will you take my money? 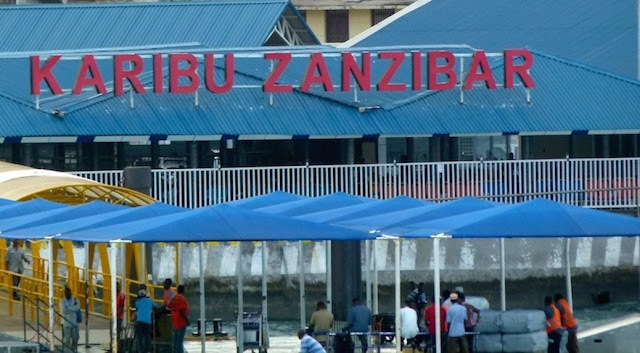 I only have Tanzanian shillings or Euros," he yelled in broken in English. The young man behind the desk reluctantly explained that they only took U.S. dollars. I thought to myself: wow, this is going to get interesting. At that moment I felt a tug on my arm. It was the young boy that had taken our money and passports. "Hurry, come with me! 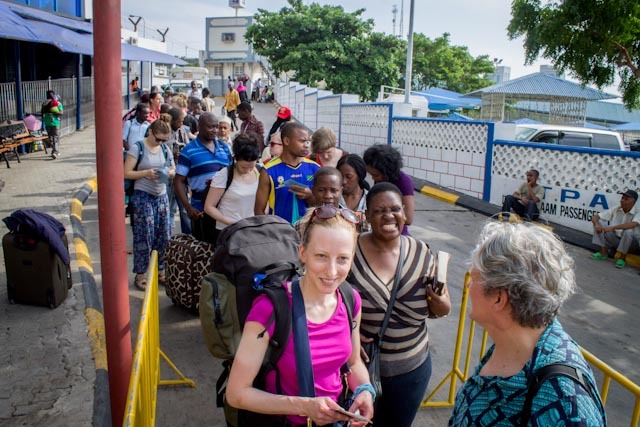 There are no more tickets for the 7:00 a.m. or 9:30 a.m. ferries. There is a man who will sell you two tickets if you come now," he explained. I grabbed my money and our passports and said "how far?" "Just up the street at the ferry station. You must hurry! The ferry is leaving soon!" I looked at Kim, and with marked hesitation, asked her to stay with our luggage and wait. At this point I wasn't sure what would be safest but at least she was inside the shack with a very angry German who I was confident would protect her. Down the street the young boy and I ran. To my surprise, the ferry terminal was only about three blocks away. I had no idea what I was about to encounter; extortion was the best outcome at this point. Being mugged and robbed was certainly not out of the question. We stepped inside the terminal and were met with signs that read "residents only" at every window. Confused, I was instructed to get in a line. The line was so long and the ferry was leaving in 10 minutes. "Where is your guy?" I asked. Reacting to my bewilderment, he replied just to wait. I felt like my head was going to explode. I couldn't believe this was happening. How gullible I must have appeared stepping out of that diner. Just then, the two Danish girls walked in. "Did you get tickets?" I asked. "No, they said they were sold out and gave us our money and passports back and told us to come here." I felt like I had been kicked in the stomach. How could we wait there in this unbearable African heat for 2-4 hours in hopes to catch a later ferry? As the line slowly inched forward, I saw out of the corner of my eye the angry German man. The young man behind the desk had brought him to the ferry and pointed him in the direction of a short line that was not marked. I watched as he spoke to an official sort of officer. Then to my amazement, he pulled out his wallet and within moments was leaving with two tickets. I quickly stepped out of line and made my way to this window. The two blond girls followed behind. "I'm not sure if this is going to work, but at this point we will miss the ferry anyway." I got to the window and began to explain my frustration. "I don't know what kind of operation is being run around here but my wife and I have been held up in a little shack down the road being promised a ticket on the 7:00 a.m. ferry. Can you sell me a ticket?," I asked. "Passports please. That will be $40," he responded. Just like that I got our tickets and rushed back to the little shack. I knew the Germans had left and Kim was alone. I stepped inside the shack and glared at the young man behind the desk and said thanks for nothing. "I am so sorry, sir. Please let me help you with your bags to the ferry." "Are you kidding me? NO!" I responded. "Please sir. The ferry is leaving soon. Let us help you." And with that, two young boys grabbed our bags and off we all ran. As soon as we got to the passenger terminal we could see the security line backed up past the gate. Surely they will hold the ferry I thought as we approached the cue. The young boys leading the way talked to the officer at the gate and suddenly we were walking past the long line and escorted to the front. We quickly passed through the check point and just like that the boys were gone. We walked up the plank and onto the ferry. With VIP tickets, we were escorted to a large air conditioned room on the upper deck with leather seats. We settled into two chairs near the front and were quickly served water and warm mango juice. Moments later the ferry pulled out of port. We made it! It was an unbelievable experience but at least we were finally on our way to Zanzibar. The large television hanging on the wall in front of us suddenly switched on and an episode of "The Adventures of Tom and Jerry" began to play. As Kim settled in, I couldn’t help but exhale a big sigh of relief that our unexpected African diversion was over.